International Journal of Research in Health Sciences,2015,3,1,169-173. *Assistant professor, Department of Pediatrics, ** Associate Professor, Department of Anesthesia, ***Assistant Professor Department of Forensic Medicine, Government Medical College, Anantapuramu, Andhra Pradesh, INDIA. 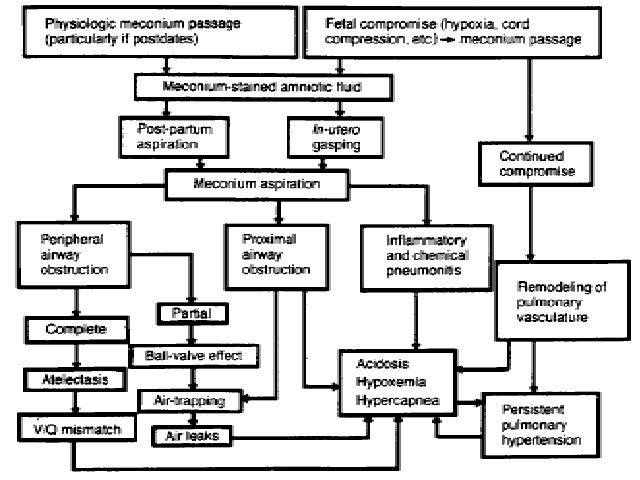 Meconium Aspiration syndrome forms one of the common cause of respiratory distress in the newborn occurring in 10- 12.5% of all the deliveries occurring worldwide and has a mortality rate as high as 40% in the affected new born. The syndrome present with wide range of complications ranging from mild transient tachypnoea to respiratory failure. Treatment modalities include Amnioinfusion, mechanical ventilation, extracorporeal membrane oxygenation and other supportive therapies. The association meconium aspiration syndrome with certain maternal, fetal, and other factors is well established in this study. It is concluded that good intrapartum suctioning and neonatal management can reduce the complications of meconium aspiration syndrome to a great extent.